Klostergasthof Andechs is a restaurant with a terrace within the Andechs Monastery grounds. It is strictly speaking not a traditional Bavarian beer garden but a Wirtsgarten. The real beer garden can be found across the road from the Klostergasthof and is referred on this website as Kloster Andechs Biergarten. Klostergasthof Andechs Wirtsgarten has elegant garden furniture shaded by large chestnut trees with waitress serviced tables only. For those who are not familiar with the distinction, a traditional Bavarian beer garden always includes a self-serviced area with typical beer garden benches. All other beer gardens listed on this site are traditional Bavarian beer gardens. Note the “Biergarten” sign at the entrance of the Andechs beer garden vs. the “Wirtsgarten” sign at the Klostergasthof entrance. Andechs is a popular destination amongst day-visitors from and around Munich as well as tourists of all nationalities. 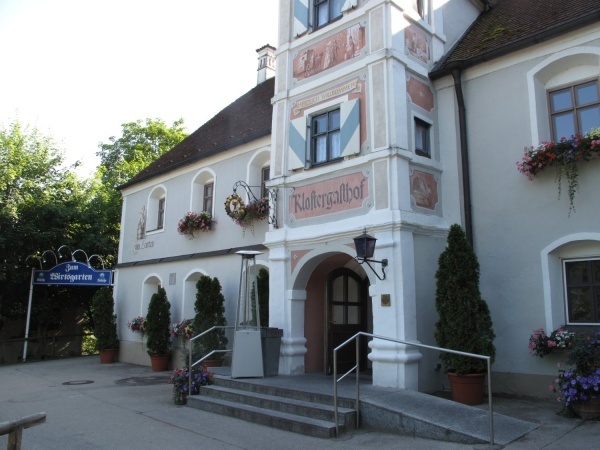 The Klostergasthof Andechs Wirtsgarten, as well as Kloster Andechs Biergarten and Kloster Andechs Bräustüberl are located on the Andechs Abbey hilltop within close walking distance of each other.